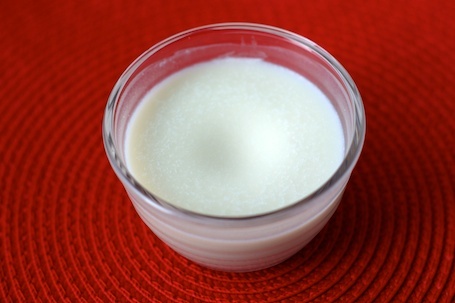 Kitchen Cosmetics: Would you care to try our house-made, artisanal deodorant? Let’s start from the premise that deodorant is problematic. For one thing, the kinds that really work are filled with all sorts of things that are suspect for your health: aluminum, parabens, propylyne glycol, and random perfumes, to name a few. It got a bad rap back in 1990 when a study was published linking the aluminum in deodorant to Alzheimer’s While the research is ultimately inconclusive, it does give one pause. So what are the alternatives? Well, there’s the deodorant crystal – a stone made of ammonium alum – but I’ve never found it to be effective. And there are some good non-toxic brands on the market, my favorite being Lavanilla, but at $18 tube, I feel sort of like a loser buying it – especially now that I know how easy it is to make at home. There are a wide array of recipes out there to help you combat the persistent quandary of the stinky armpit. Some have few ingredients, some have several – but they all include the magical element that is baking soda: the great neutralizer. Why is sodium bicarbonate so awesome? You can use it to leaven your bread, scour your tub, brush your teeth, deodorize your fridge and at the end of the day, you can sprinkle it in your armpits, too! 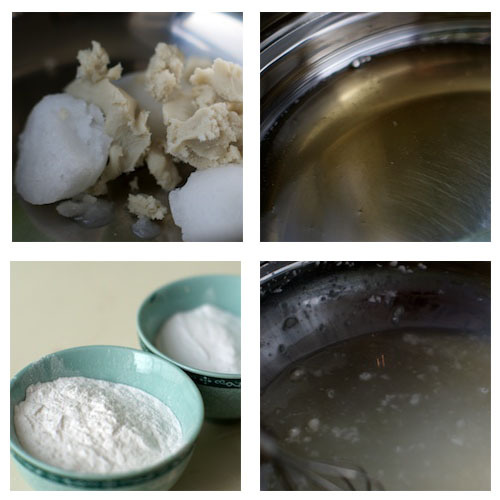 Melt the Coconut Oil and the Shea Butter together in a double boiler. Once melted, stir in the arrowroot and baking soda, mixing thoroughly. Pour into a glass jar to cool, stirring occasionally to keep the oil from separating. It takes about 5 minutes to mix together and a few hours to cool. I find that if you put it in the fridge overnight, it solidifies nicely and you don’t need to store it in the fridge after that. It forms a thick paste that you can apply with your fingertips. If you want a thicker paste, you could add more arrowroot. I think 2 T. of baking soda is enough to be effective, but using more could irritate the skin. Same with the essential oils. They are not necessary, but can add a nice scent. On the other hand, tea tree oil is a little intense. You have to play around a bit to find what works best for your skin. So why go to the trouble to make your own deodorant when you can easily find a decent brand on every street corner? Because the ingredients are inexpensive, you can spend all the cash you save by making your own deodorant on expensive mascara (which I do not recommend going DIY on). You bypass all the packaging. Yay! Because it works! How do I know? Because my husband even uses it and he’s, well, a man. This entry was posted on February 17, 2012, 8:08 am and is filed under Kitchen Alchemy, make. You can follow any responses to this entry through RSS 2.0. You can leave a response, or trackback from your own site. Does this also work as an anti-perspirant? Or does it just do something so it doesn’t smell when you do in fact sweat? I already make my own “shampoo” with baking soda and water. This might be the next step. Thanks for finding and posting a nice, simple recipe! Hmmm… this might be going into my folder of “things to try.” But where do you buy the non-baking soda ingredients? Hi There- I got the coconut oil ($9.99), Shea Butter ($17.99) and arrowroot powder ($6.99) at Whole Foods – although you could probably find them at another natural foods store or order online. The total investment is about $35, but will make you more than a year’s worth of deodorant, if not more. Cheers!